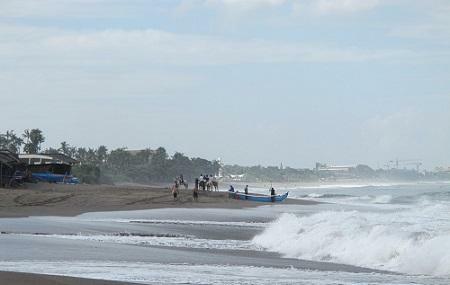 This black sand beach on Bali’s southwest coast is mainly used by fishermen to bring in their catch from sea. It is not heavily developed and has few amenities. There are no series of restaurants along its length. Surfers won’t find great waves here. But if you want to just lay around or stroll along a beach that is neither too isolated nor too crowded, this is the beach for you. If you want to see the fishermen heading out to work, try coming early in the morning. Alternatively, come in the evening for a stroll during sunset. The atmosphere at this beach is quite rural. Calming beach at Canggu area. I enjoyed much more than Echo Beach & Batubolong Beach. Not so touristy, and you can see the traditional fisherman boats parked at the beach sand. There are few beach cafes in case you need some supplies for your tummy. Perfect to bring young kids and dogs while enjoying the sunset. I ate at this restaurant and will highly recommend it. They claim to make the best bbq pork ribs in Amed. It's true, they were delicious. Their presentaion and sevice were at a very high level. Closer to the better Europan restaurants than what you would expect in Amed. Chapeau to Augusto, the chef, and Ari, the boss. If surfing is your calling or you want to learn surfing, this is the place you should go to. Opposite to other crowded beaches around, this one is much quieter and you'd get a lot of free place to sit and get lost in the moment or to get that tan you've been wanting since a long time. The privacy and serenity that this beach provides is unmatched. Lovely villa, clean, spacious, comfortable beds, nice bathrooms and plunge pool, 5 minutes walk from beach, restaurants and great coffee on the doorstep. I want to come back here for sure.